When considering what fruits to eat, diabetics and anyone needing to keep their blood sugar under control express the most concern over whether or not said fruits will make their blood sugar go up. The truth is all fruits raise blood sugar levels, some a lot, some not so much. Strawberries for example have overall modest glycemic effects given their relatively moderate carbohydrate content, hence their low glycemic index and glycemic load scores. When consumed in moderation, of course. As a low-glycemic fruit, they are a good option for diabetics and anyone dealing with hyperglycemia. Yes, they do, in both diabetics and non-diabetics. And the reason why strawberries raise blood sugar is because they contain digestible carbohydrates. Digestible carbohydrates are broken down into their simplest form, sugar, which is then taken up by the body, meaning absorbed into the bloodstream as all other nutrients are. Naturally, this causes blood sugar levels to rise. It’s a normal process really, just the body’s way of getting its nutrition from carbohydrates in order to support metabolic functions and various systems and organs. But just because strawberries, others fruits and foods containing carbohydrates go on to raise blood sugar levels, that doesn’t necessarily make them bad for you and it sure doesn’t mean you have to stop eating them or cut out all carbs. You need carbs and you need sugar in your bloodstream to be able to live and function, whether you’re diabetic or not. What’s really important is how carbohydrates in fruits or other foods raise blood sugar, more exactly, how fast and how much. Basically, the more digestible carbohydrates in a food, the more pregnant the glycemic effects of said food. The lower the carbohydrate content, the lesser the glycemic effects. The more indigestible carbs in a food (example: fiber), fat and protein, the lesser the glycemic impact. And, of course, the bigger the portion/serving size, the more carbs you get and the greater the impact on blood sugar. 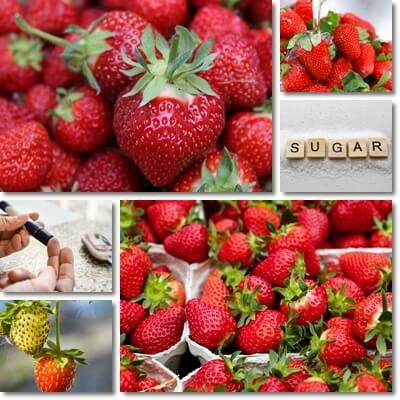 How many carbs and how much sugar and fiber in strawberries? 100 g of raw strawberries has 7.68 g of carbohydrates of which 4.89 g sugars, another 0.79 g of digestible carbs and 2 g dietary fiber. One cup of strawberry halves (estimated weight: 152 g) has 11.67 g of carbs of which 7.43 g sugars, another 1.24 g digestible carbs and 3 g dietary fiber. One cup of whole strawberries (estimated weight: 144 g) has 11.06 g of carbs of which 7.04 g sugars, another 1.12 g digestible carbs and 2.9 g dietary fiber. A diabetic is advised to have around 30-45 g of carbohydrates per main meal (fairly general recommendation that needs to be adjusted to each diabetic patient in order to suit their individual nutritional requirements and the restrictions of their condition). This would mean that a small serving of fresh strawberries, be it half a cup or a whole cup should not take up much of their daily carbohydrate allowance and, at the same time, provide some benefits for diabetes and general health (such as better blood pressure numbers, improved cholesterol profile, minor benefits for wound healing from vitamin C or for nerve damage from B vitamins and antioxidants). Bottom line is: strawberries are OK to eat if you have diabetes, or not, because, even though they raise blood sugar, the rise they cause is modest and manageable. More exactly, steady and gradual. This is all thanks to the fruit having good amounts of dietary fiber which slow down digestion and the rate of sugar absorption into the bloodstream. Provided, of course, intake is reasonable. How many strawberries can a diabetic eat per day? There isn’t a set number of strawberries you must/can/are allowed to eat in a day with diabetes. It’s rather more a question of keeping to a limited total carbohydrate intake. As a diabetic, 30 to 45 g of carbs per main meal is seen as a reasonable intake, although you may adjust your uptake according to your individual nutritional requirements, restrictions of your condition, level of physical activity etc. Now, you can have white bread or crackers or sweets worth 30 to 45 g of carbs or you can have whole grains, leafy greens and healthy, low-glycemic fruits such as strawberries, tomatoes, cherries, pears or apples. Mind you, you’ll get so much further in terms of satiation, nutrition and blood sugar control with the second set of healthier options. But whatever foods you choose to eat, at least make sure you keep you intake under a certain amount. Fresh strawberries have a moderate carbohydrate content, good amounts of fiber (they are almost 91% water) and, so, limited glycemic effects. Actually, with a low glycemic index score (40) and an even lower glycemic load score (3 for a serving of 100 g, 4-5 for a serving of one cup, whole fruits and halves), they generate a steady and gradual rise in blood sugar levels that is actually manageable. 1) It helps to start out with small servings at once, whether 50 g of the fresh fruit or half a cup. 2) Notice how different portions affect your blood sugar and adjust your intake accordingly. 3) Fresh strawberries have the lowest glycemic values of all strawberry products. Whenever possible, choose the fresh fruit over juice, jams, jellies, dried or frozen sweetened strawberries or other food products containing them. 4) Eat them raw. Cooking makes carbohydrates more readily digestible and increases glycemic scores. 5) Don’t have fruit on an empty stomach, before a meal. Always after eating. 6) Don’t pair fruit with fruit. One serving of one fruit at a time is as good as it gets. 7) Pair your fruit with light protein such as nuts, seeds, eggs, cheese, fish, chicken for reduced glycemic effects. 8) Exercise after having fruit to lower your blood sugar, improve glucose tolerance, insulin sensitivity and avoid weight gain. 9) Strawberry shakes can be considered, but they are best prepared with milk, not water. Also read Does Milk Raise Blood Sugar? Milk has fat which will slow down stomach emptying and reduce the glycemic effects on the entire product. You can puree a small amount of the fresh fruit and mix with a little milk for a delicious home-made shake. If the shakes are store-bought, make sure you check the nutrition label for important information such as ingredients, including type and amount of sweeteners used (look for healthy sugar substitutes for diabetics), carbohydrate, fiber content etc. Also, keep in mind that there is sugar in milk too, lactose, so account for it too when preparing your shake by adjusting portion size.